Drudge is calling this "DC'S NASTIEST DAY." Breitbart is crediting Brett Kavanaugh with giving the "SPEECH OF HIS LIFE." HuffPost is billing it as the "HELL HEARING" with the "JUDGE IN THE SLUDGE." And the front page of Friday's NY Daily News is quoting Christine Blasey Ford: "100% IT WAS HIM." 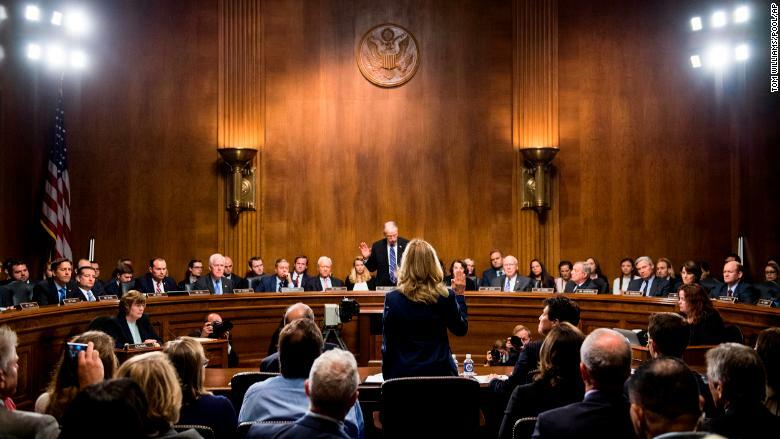 -- CNN's Chris Cuomo: This was a "riveting and regrettable day in American history..."
-- In her column for The Cut, Rebecca Traister said Ford's testimony was heroic -- "a moment so powerful that it prompted furious, admiring tears..."
-- WaPo's Dan Balz: The hearing "devolved into the worst of Washington. It was a partisan brawl on steroids that will leave the country more deeply divided than before..."
-- TownHall's Katie Pavlich responded and said: "Nope. There were millions of women on Kavanaugh's side today..."
-- Megan McArdle tweeted: "I think the left half of the political spectrum really doesn't understand the unquenchable rage on the right at having this sprung on them at the last minute. I'm not sure the right understands the unquenchable rage that would result on the left from confirming Kavanaugh..."
-- Douglas Brinkley on "CNN Tonight:" Kavanaugh "came off as a tool of Donald Trump..."
-- My wife Jamie Stelter tweeted: "Will tomorrow be better or worse?" The hearing "unspooled over nearly nine hours," or "about the length of a prestige mini-series, binged Netflix-style in one wrenching, riveting sitting," the NYT's Michael Grynbaum wrote. Most people didn't watch in one sitting, though. Most people picked up bits and pieces here and there. I think it's important to keep this in mind. Per Grynbaum's story, "network executives expected Thursday's viewership to rival the 30 million people who tuned in for another generation-defining TV event: the testimony of the Supreme Court nominee Clarence Thomas and Anita Hill in 1991." Thursday provided little in the way of new info, new evidence. "There could have been a deeper search for truth" through an FBI investigation, but Republicans leaders are stubbornly refusing to "perform the necessary due diligence," WaPo's Margaret Sullivan noted in her column. So "truth is available — just as it has been throughout the past two tumultuous years. But whether, in tribal America, truth is desirable is another matter..."
-- David Zurawik summing up the day: "Lots of emotion and little new information..."
-- Tucker Carlson on Thursday night: "No Supreme Court nominee has spoken like this in memory. Not even Clarence Thomas. But then none has been accused more recklessly or less evidence than Brett Kavanaugh has. And he did nothing to hide his rage..."
-- "Is this good?" Read NYT's Jennifer Senior on "the pain of watching Christine Blasey Ford be so accommodating to the people questioning her..."
-- LAT's Matt Pearce tweeted: "It just feels like we're stripping the paint off America one layer at a time..."
-- The Weekly Standard's Jonathan V. Last: "It's impossible to look at the Ford-Kavanaugh hearings and not see America as a nation in decline..."
"I'm coming up with one cliche after another: Being in the room was an extraordinary, emotional and at times a surreal experience. It was the rare feeling that history was actually being made — the kind that you'll think about for decades — in front of my eyes. And in addition to just the largeness of the moment, there was also a kind of reporter-adrenaline high, of knowing that I had to be the eyes and ears for the network so that everything my colleagues couldn't see or feel through the three cameras in the room could be adequately chronicled. I'm hoping to go back and watch most of the hearing today soon, the way that it was aired. I'd love to know what people watching from home saw, and what I might have actually missed by being in the room. (Oh, and by watching it *without* a Tweetdeck on my computer screen moving at lightning speed.)" There was a media world consensus about Ford's morning testimony: She was a very credible witness. The GOP's outside questioner, on the other hand, was widely criticized. After the first break, Chris Wallace said on Fox News that "this is a disaster for the Republicans." But some impressions changed over time. At the end of the day on MSNBC, Nina Totenberg described being live on NPR at midday, during a break from Ford's testimony, with "a bunch of other observers and journalists, all of whom thought, essentially, he was toast. And I reminded them that we thought Clarence Thomas was toast. And he wasn't." In the afternoon, Kavanaugh showed "you can sometimes bull your way through these things." "He feels attacked, so do they." Quoting from S.E. Cupp's column in Friday's Daily News: Kavanaugh reflected a "deep and growing anger among average Americans over what they have seen as a political hatchet job." Key line: "His frustration is theirs. He feels maligned, so do they. He feels attacked, so do they. He feels like a prop in a political game, so do they..."